I rarely eat ramen. Traditionally the stock is made from pork bones for that rich and savoury flavour which ramen required. This also means that the broth, at most times, tasted (and smelled) very porky. As some of you might know, I am not a big fan of pork – partly because I love pigs and a big part is because I can’t stand the smell of pork. (actually the only item I eat) is their Aka-ramen. 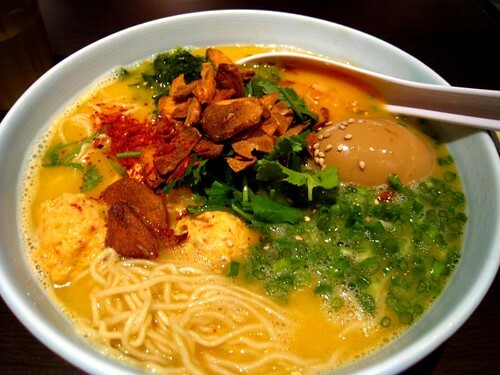 Marutama’s Aka-ramen stock is made up of not just the chicken stock, seven different kind of nuts were also added to give the broth a rich and smoky flavour. The noodles were springy and chewy; the chicken meatballs were plump and juicy. I also ordered a Shoyu egg which was gooey and yummy. Everything was so comforting. What’s great at Marutama is they have these fried garlic chips which you can add in your ramen. I always have to stop myself from dumping the whole container of these delicious chips into my ramen. 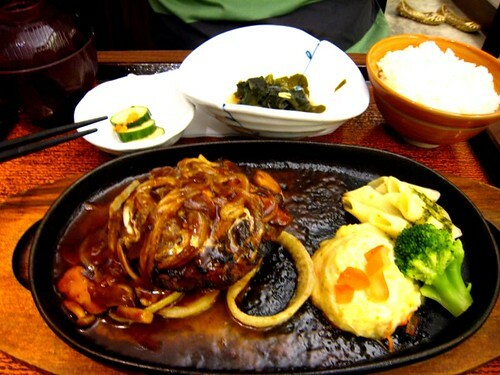 If you seek comfort food for your soul, run to Marutama and get yourself a bowl of deliciousness. remembered that terrible case of food envy? 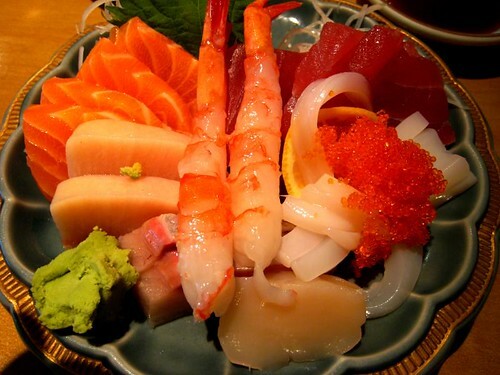 on that same week, i actually made a trip back to matsuo sushi and order the sashimi set. it was everything that i hoped for. every piece on that plate was fresh and sweet. i was never a big fan of octopus – but theirs was such a delight – tender with a bite. and that sweet succulent ebi. the sashimi set also came with a small bowl of creamy potato salad. to be honest, i can eat a HUGE bowl of it. though i no longer have food envy, now i want to eat this everyday. i am not sure about all of you – after i ordered something, the next thing you know i am eyeing on someone else’s lunch/ dinner instead of focusing on mine – FOOD ENVY! i was at my favorite japanese restaurant matsuo sushi for lunch (i can only afford their set lunch :p) and the unagi set was the lunch special. 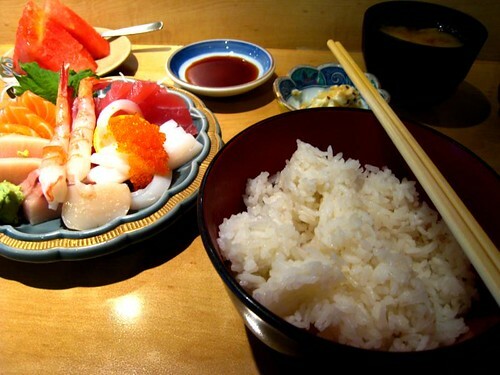 included in the set was a plate of salmon sashimi and i thought “oh great. two of my favorite things to eat”. and of course the lady beside me got to order the sashimi set which got me thinking whether i make the right choice for my lunch. sadly i didnt make the correct decision. the salmon sashimi was great – cold and fresh. 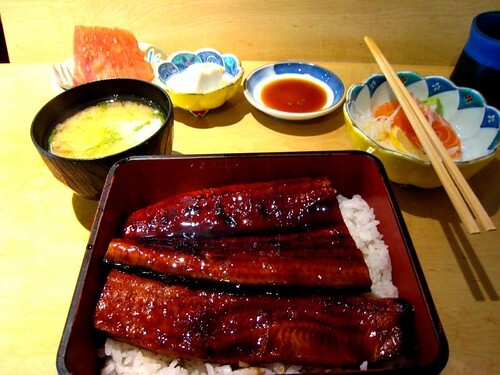 but the unagi. i wished i can say i like it. but the glaze was overly sweet. 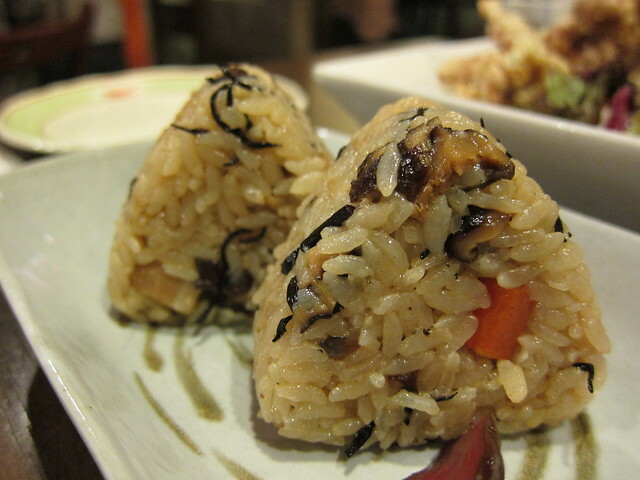 it was so sweet that i only managed to finish two slices of unagi. and of course, while i was having my lunch, i keep eyeballing on someone else’s sashimi set and scolding myself for not ordering it. arghhhhh. perhaps its singapore hot and humid weather all year round, i always have a weakness for cold soba noodles. there is something so comforting slurping these buckwheat noodles loudly, splattering a bit of the dipping sauce around the face. yes it can be a messy affair but it feels so good. the first time i tried shimbashi soba, i fall in love with their homemade soba noodles. they tasted fresh, and have a great texture. its been years since i last went to shimbashi, and i am hoping nothing has changed. 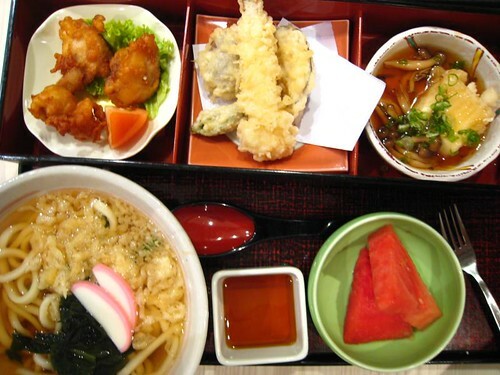 my friend k and i tried two different set lunches at shimbashi. 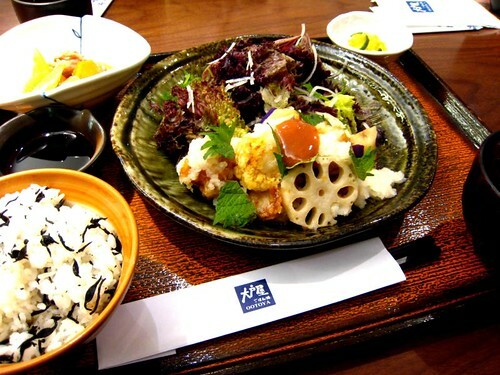 k went for the value shokoda set which consisted of fried chicken, agedashi tofu, assorted tempura and hot udon soup. since she finished all her food, i will assume everything went well. 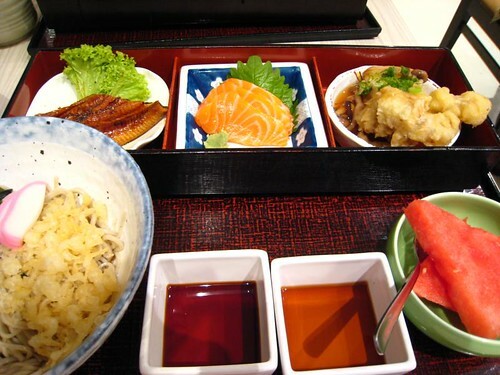 for me, my shokoda set consisted of fresh salmon sashimi, unagi, fried soft shell crab and cold soba noodles. the three accompanying dishes were decent though i do find the batter for the soft shell crab was rather thick and abit undercooked. the cold soba noodles were great. the thickness of the noodles was just nice, and they were cooked al dente and i heart the chewiness. although i did wish that they did not pour the dipping sauce in the soba noodles bowl, i would much prefer that they will be separated. despite that we were quite stuffed, we still ordered dessert. k got herself a matcha brulee which was accompanied by a scoop of vanilla ice cream and soba chips, and this time i got a taste of it. like any good creme brulee, it was smooth, rich and creamy. thus i find the vanilla ice cream rather redundant. as for the soba chips, it was abit weird for my taste. the chips were made from the noodles buckwheat flour mixture, they were fried and lightly coated with sugar and sesame. the taste? it was neither sweet nor savory thus equal weird. 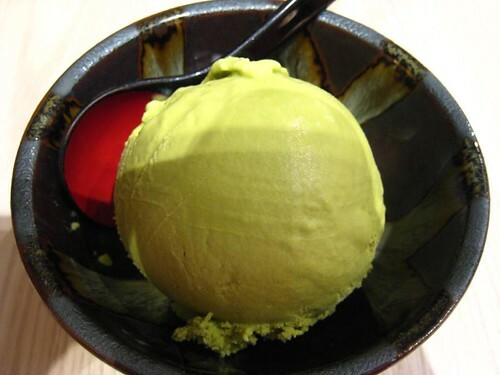 as for me, i was seriously stuffed from lunch – i can only managed a scoop of green tea ice cream. and it was the biggest scoop of ice cream i ever had. despite the generosity, i will not be in a hurry to order this again – it was too sweet for my taste and i find the matcha flavor is not as apparent as the creme brulee. after reviewing the ala-carte menu, i realised that the set lunch is not exactly “valued” as it should be – its rather costly compared some of the ala-carte items. oh well, next time i will just stick to my usual tempura seiro. 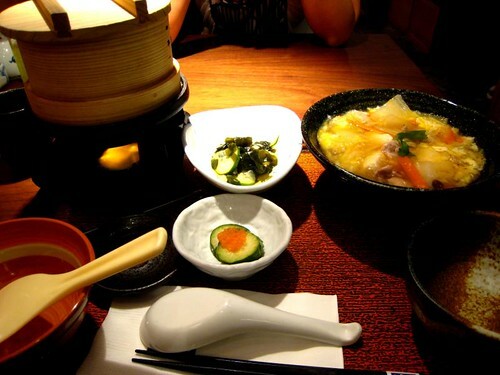 while i msn-ing my friend k, out of nowhere, i just went “i got craving for ootoya. its been awhile since i go there”. my wonderful friend k said that she is available and we can go have ootoya. awwwwww. 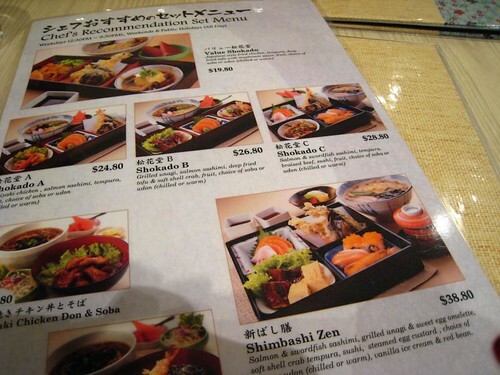 despite my friggin obsession w ootoya, i have yet to try everything on de menu. 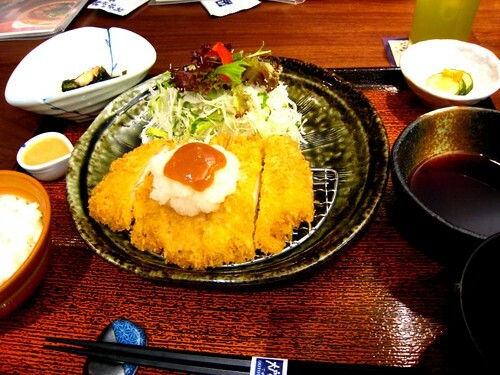 i opt for fried chicken and scallop with grated radish and plum sauce. this dish also came with fried egg plant and lotus root. both de fried chicken and scallop have pretty great flavor and go v well w de grated radish. but what steal my heart was de fried eggplant which was surprisingly delicious and aint mushy. de lotus root was pretty tasteless. and i dun fancy de plum. just tasted weird. 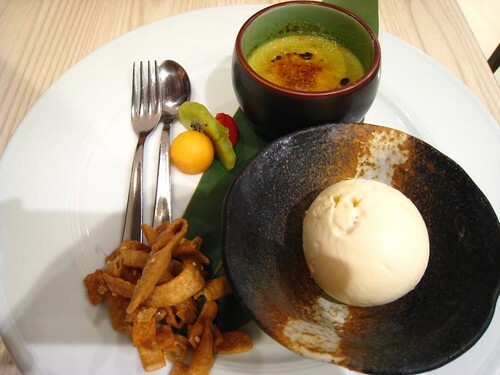 and of course its impossible going to ootoya and not order any dessert – its WRONG if you do not order dessert. and wrong if you are sharing dessert. ha. 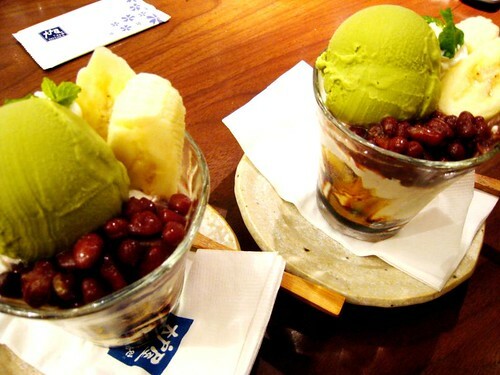 k and i ordered de lovely green tea parfait. its good. v v good. happy now. it is not often that i find a nice place to eat and keep wanting to go back. 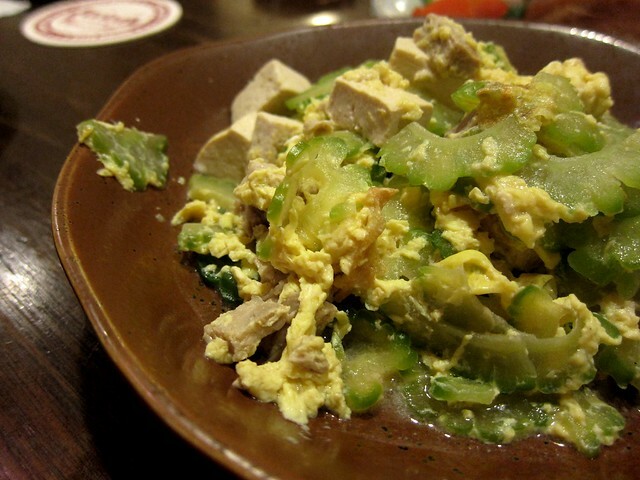 ootoya is de rare find. 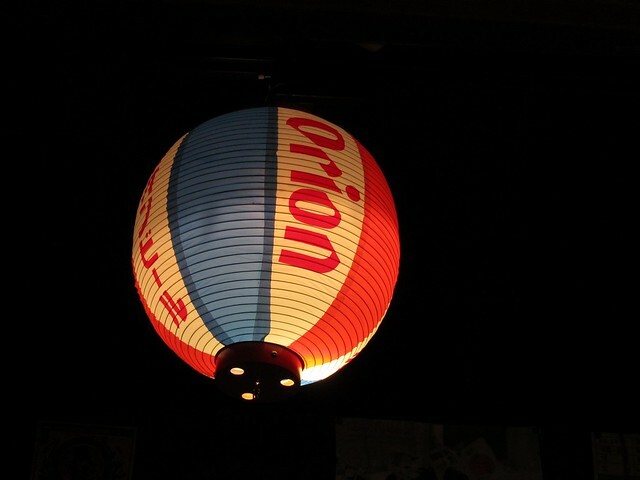 and because of ootoya, i will find myself in singapore most useless mall – orchard central. 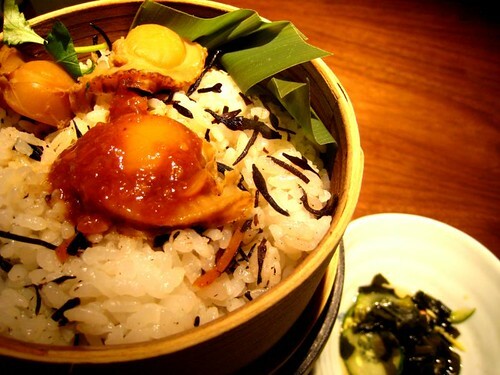 located on de eighth floor of de mall, ootoya hailed all de way from japan and specialises in set meals. 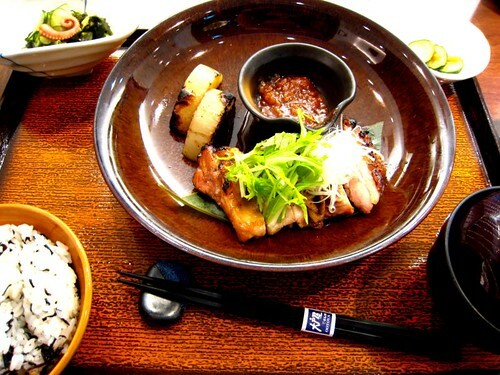 each set meal consists of a main (protein), appetiser, soup and rice. 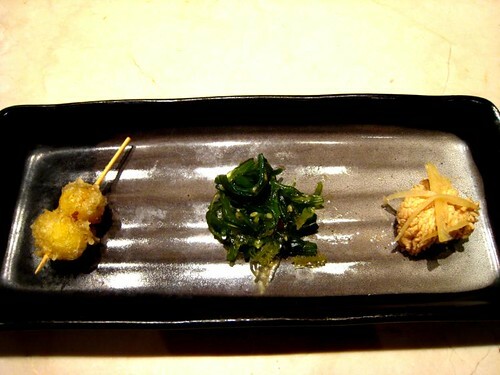 and for de rice, you get to choose plain, seaweed, grated daikon or some ikan billis lookalike fish. 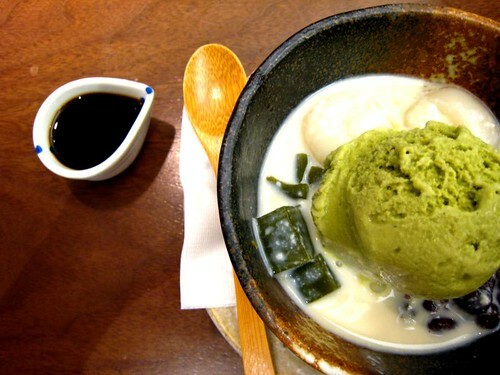 what i really love about ootoya is de free flow green tea – its not just any green tea, its genmai cha! yummy. 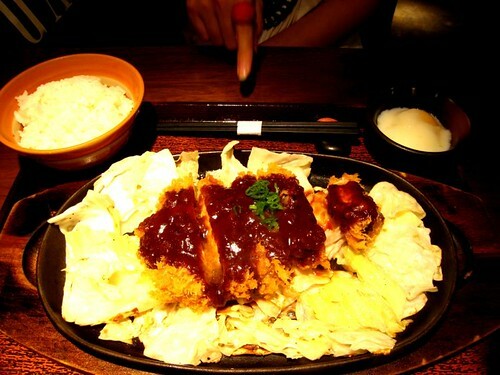 kat had de pork katsu which i think she quite enjoy. i hope. 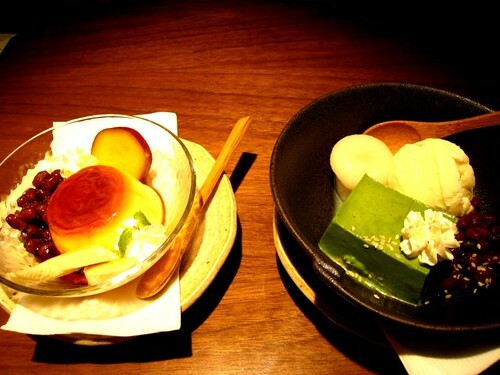 after dinner we got ourselves dessert – green tea mousse and caramel pudding. de green tea mousse was nice and rich and full of matcha flavor. while de caramel pudding was pretty good too though de burnt soy sauce takes awhile to get use to. m got herself chicken katsu which looks pretty good. while de rest of gang got themselves de hamburger set which look damn good. we were in a v selfish mood where we did not share each other food. we just kept to ourselves. ha. 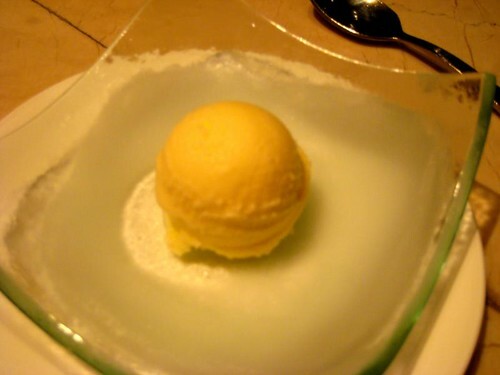 after dinner, we all ordered de same dessert – match ice cream! de flavor was wonderful – rich and simply awesome. de same week, i went back to ootoya again! i have an hour for lunch before my appointment. this time round i ordered de grilled chicken with leek. de leeks was rather sad but de grilled chicken was really awesome. de grilled flavor really come through and de chicken skin is yummy. 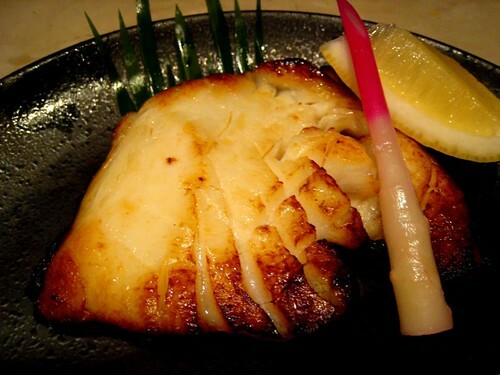 and de grilled daikon was great too. its nice and juicy. i also ordered a matcha parfait. however i waited and waited and it did not come through. as i was going to be late for my appointment, i have to cancel my order. the problem i have with ootoya is their service. its not consistent. and de funniest thing is that i find their service is worst when there is hardly anyone in the restaurant. i have to signal them to get me a refill for my tea. i waited more than 15 mins for dessert before i cancel it. i will definitely go back to ootoya for its wonderful food (oohh btw did i mention there is calories count for each meal you order – so if you are on a diet, you know what to avoid). and not to mention the reasonable price. so far, on an average, i spent about S$25 for a set meal and dessert which is pretty good. i just hope de service will improve over time. 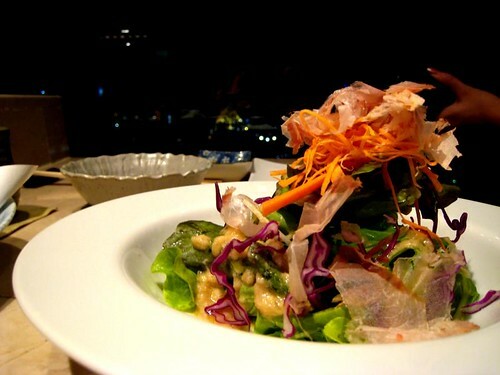 oink’s guide to … Bangkok! Up, up and away!! since its my dear friend K birthday, i decided to buy her a meal at somewhere nice. one thing i love about bangkok is that you can go to a really posh place and de food is still affordable (its not cheap but reasonable). 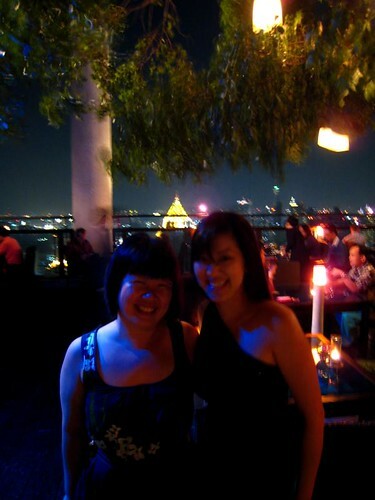 and of course i decided to bring my “height-challenged” friend to taihei, banyan tree for dinner. and 53 floor up to be exact. we order a seafood teppanyaki set to share w lotsa of stuff. 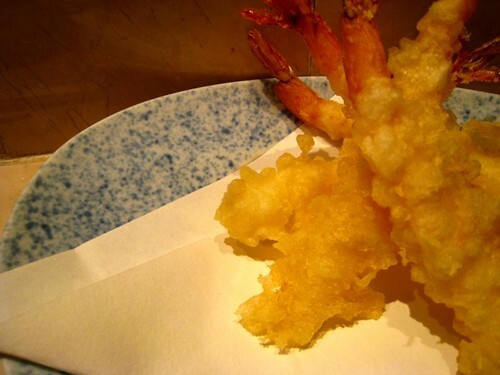 next dish – ebi tempura. batter is light and no alkaline taste. de prawn is pretty fresh too. its good but not unforgettable. 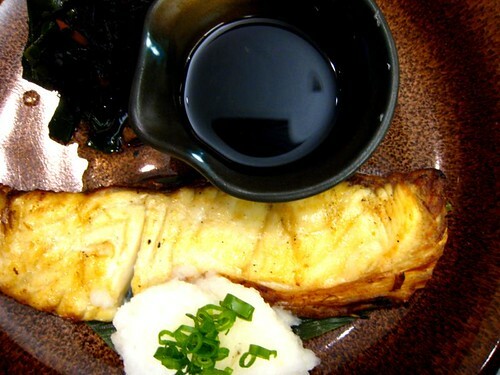 i love de miso butter fish! almost my favorite dish of de night. de fish has charred taste and its ohhh so sweet. yummy. 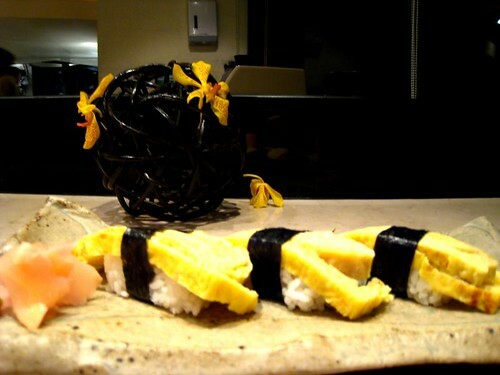 cun remember why we ordered tamagoyaki sushi. taihei version is just not right. de egg is not sweet and its just plain. its just plain weird. 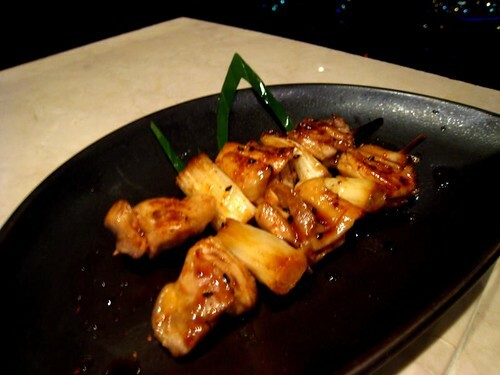 chicken yakitori is up next. once again, decent yakitori. well seasoned. just alright. finally our teppanyaki arrived. 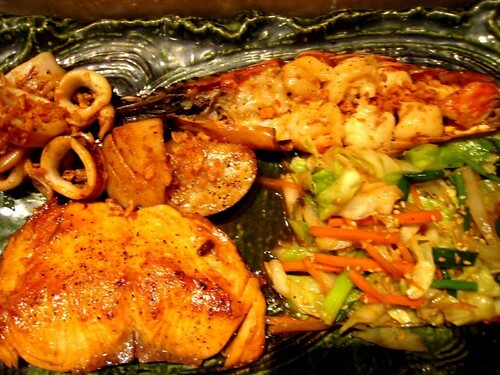 de set consists of squid, salmon, prawn and vegetables. de squid is pretty good. at least better than last night squid at sornthong. de salmon was overcooked. thus i find it a bit tough. 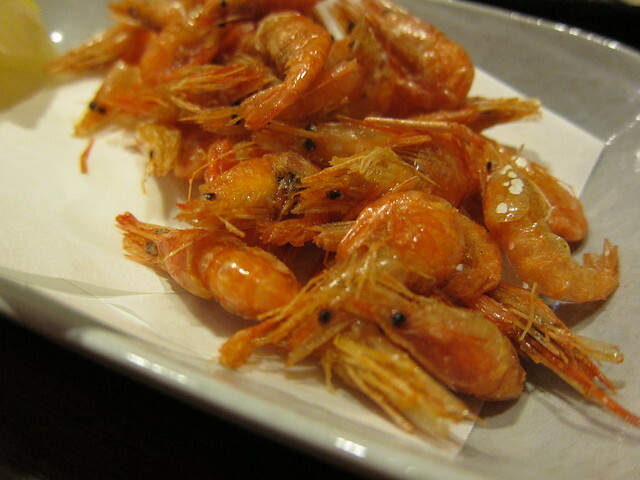 de prawn is nice and juicy (i think thailand got really good prawns!). BUT my favorite got to be de vegetables. its coated with BUTTER. good seasoning and lots of butter make vegetables taste ohhh so good. 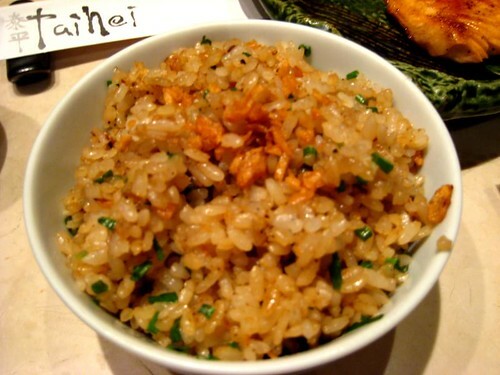 and of course not forgetting de garlic rice that comes w de set. K dun really like it as it tasteless. i rather quite like it that way. it just brings up de garlic flavor. well on de other hand, i love garlic. de truth is de meal at taihei dun exactly blow my mind. i v much doubt i will go back there again. there is no one dish that i crave for. however i have to give them de credit for fantastic service especially this dude named amnrat. he is just great – try to speak to us in mandarin, offered to take our pictures. 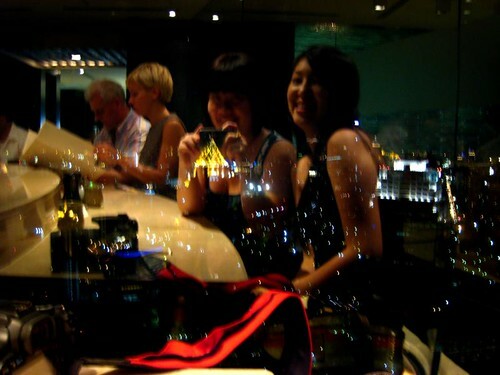 and he even make us walk through de different restaurants and insists we take a picture de top of de hotel. if i ever go back there, chances are its for de ambience and great service. 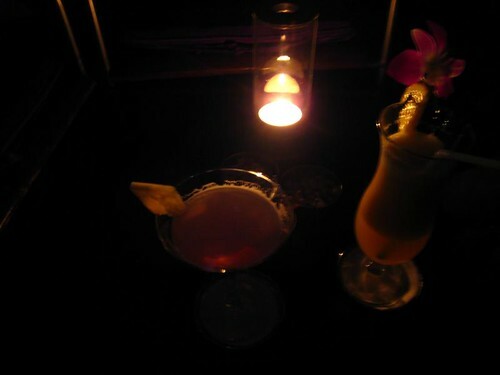 after taihei, we went for a drink at vertigo. its a nice drinking hole where you can sit and relax and enjoy de view. or see a poor german dude who got sabotage by his aussie friend. this aussie dude insists that his friend take picture of me and K using K’s slr (btw all de pics turned out blurred). yes de people we meet. 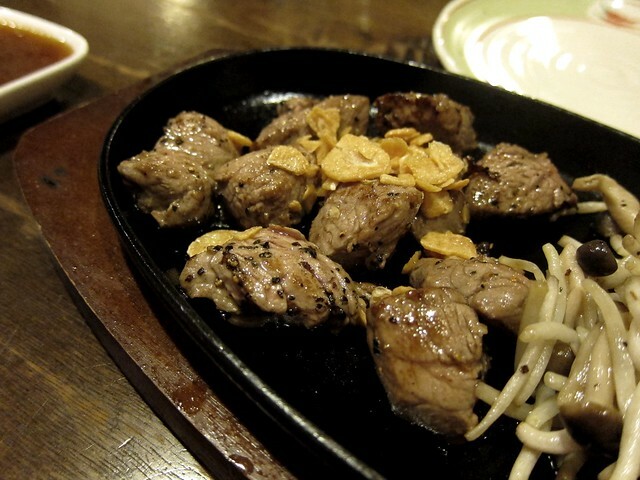 way back in june, my boss j, mentioned that there is a new japanese bbq place, nagomiya, that is near my house. aroozoo ave to be exact. i was like HUH! its been a long long time since i walked along that road. ever since de swimming pool at aroozoo was closed, i do not see the necessity to walk along there (even though its a pretty nice place to stroll around in de evening). anyway, what happened was some dude decided to convert de swimming centre to several eateries and a prawning farm. yes de swimming pools got converted to prawning pool. duh. 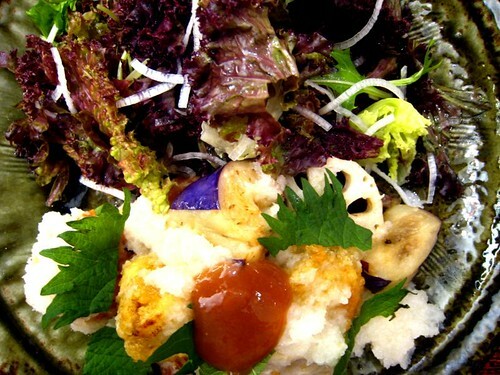 i quite like de food at nagomiya – de japanese bbq place. de food is pretty fresh. everything is pretty well seasoned. items like chicken, seafood are pretty alright. but it de beef that captures my heart. i especially love de special beef rib. it jus melts in your mouth. ohhh i also like de korean hotpot rice and garlic rice there too. but one thing i dun fancy about de place is de service. it varies. depending on your luck. de first time i was there, they were pretty short-handed. so everythin was slowwwww. de second time i was there, de waitress told us that de set that i usually ordered which also comes w free flow of drinks, i can opt out that option and save myself $20! de set which is for 2, comes w 2 choices of rice or noodles. intially we were not allow to choose one each. NOW we can. hmmmm. v v not consistent.